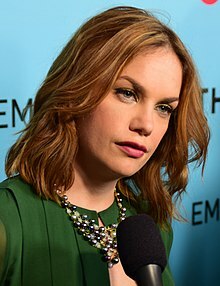 ^ "Ruth Wilson". TVGuide.com. Archived from the original on September 10, 2015. ^ a b Stolworthy, Jacob (23 February 2018). "Ruth Wilson sheds light on Luther season 5 return: 'Alice is back with a vengeance'". The Independent. ^ "Olivier Winners 2010". olivierawards.com. Archived from the original on 10 February 2015. Retrieved 7 April 2014. ^ Brockes, Emma (31 August 2012). "Ruth Wilson: acting up". theguardian.com. Retrieved 7 April 2014. ^ Gordon, Jane (2013-07-27). "While Hollywood is crazy for British actress Ruth Wilson – and the truth behind those Johnny Depp rumours. | Daily Mail Online". Dailymail.co.uk. Retrieved 2016-08-31. ^ ""Comparative Media Law & Ethics" by Tim Crook". ma-radio.gold.ac.uk. Archived from the original on 9 September 2012. Retrieved 7 April 2014. ^ Eden, Richard (23 September 2012). "Lone Ranger star Ruth Wilson spies film about her bigamist grandfather". telegraph.co.uk. Retrieved 7 April 2014. ^ Eyre, Hermione (21 July 2011). "Ruth Wilson on her sizzling summer with Jude Law". standard.co.uk. Retrieved 7 April 2014. ^ "2011 : APPEARANCES". toby-stephens.tumblr.com. 3 February 2014. Retrieved 31 October 2015. ^ Stephen Robb (10 August 2006). "Jane Eyre star's fast-rising fame". BBC News. Retrieved 2008-08-30. ^ Rock, Malcolm 20 Questions With… Ruth Wilson Archived 4 August 2007 at the Wayback Machine, What's on Stage (21 May 2007). ^ Calvi, Nuala Jane Eyre actress Wilson presents Lilian Baylis Awards, The Stage (12 June 2007). ^ "BBC – Small Island". BBC Online. Retrieved 15 August 2011. ^ Warner, Sam (23 February 2018). "Luther's Ruth Wilson drops series 5 Alice Morgan hints". Digital Spy. ^ "In praise of … Ruth Wilson". The Guardian. London. 15 August 2011. p. 30. Retrieved 25 June 2012. ^ Busch, Anita (2016-01-19). "Osgood Perkins' 'I Am The Pretty Things That Lives In The House' Casting Up". Deadline. Retrieved 2016-08-31. ^ a b Clapp, Susannah (2016-12-18). "Hedda Gabler review – Ruth Wilson shines in Patrick Marber's Ibsen update". The Guardian. ISSN 0261-3077. Retrieved 2017-02-21. ^ "Ruth Wilson Hedda Gabler at the National Theatre is one of the performances of the year – review". The Telegraph. Retrieved 2017-02-21. ^ "MrsWilson". BBC One. BBC. Retrieved 2 December 2018. ^ Mrs. Wilson (2018): Full Cast & Crew, IMDb, Undated.Retrieved: 5 December 2018. ^ Philistines official web page at the National Theatre Archived 28 May 2007 at the Wayback Machine. Nt-online.org. Retrieved on 2012-02-20. ^ Billington, Michael (29 July 2009). "Theatre review: A Streetcar Named Desire". The Guardian. London. Retrieved 4 March 2012. ^ Billington, Michael (17 June 2010). "Through a Glass Darkly". The Guardian. London. Retrieved 14 July 2010. ^ Kate Kellaway (2013-12-15). "The El Train – review | Stage". The Guardian. Retrieved 2016-08-31. ^ "The Mayor of Casterbridge". BBC. Retrieved 31 December 2017. ^ "BBC Radio 4 – Saturday Drama, Mike Walker – Spitfire!". BBC. Retrieved 7 November 2017. ^ "BAFTA TV Award 2007". imdb.com. Retrieved 9 January 2015. ^ "Nominations for Broadcasting Press Guild 33rd Annual Television and Radio Awards". broadcastingpressguild.org. Broadcasting Press Guild Awards. Retrieved 9 January 2015. ^ "List: Nominations for the 65th Annual Golden Globe Awards". foxnews.com. Retrieved 9 January 2015. ^ "Satellite Awards for 2007". imdb.com. Retrieved 9 January 2015. ^ "Satellite Awards for 2010". imdb.com. Retrieved 9 January 2015. ^ "Olivier Winners 2010". Society of London Theatre. Retrieved 11 April 2019. ^ "Olivier Winners 2012". Society of London Theatre. Retrieved 11 April 2019. ^ Ellwood, Gregory (11 December 2013). "2015 Golden Globe Awards nominations – complete list". hitfix.com. HitFix. Retrieved 9 January 2015. ^ "'Birdman' Leads Satellite Awards Nominations". thewrap.com. The Wrap. December 2014. Retrieved 9 January 2015. ^ "2015 Tony Award Nominations". nytimes.com. The New York Times. Retrieved 28 April 2015. ^ Kilday, Gregg (29 November 2016). "Satellite Awards Nominees Revealed". The Hollywood Reporter. Retrieved 3 December 2016. ^ Clarke, Stewart (1 November 2017). "'Lady Macbeth' Tops Nominations for British Independent Film Awards". Variety. Retrieved 5 November 2017. ^ "Olivier Winners 2017". Society of London Theatre. Retrieved 11 April 2019. ^ a b "Nominations announced: Virgin Media British Academy Television Awards and British Academy Television Craft Awards in 2019". www.bafta.org. 28 March 2019. Retrieved 28 March 2019. Wikimedia Commons has media related to Ruth Wilson.